Made of a high strength composite film, PowerTabs adhesive grommet tabs are just as strong as regular Banners Ups® and stronger than plastic grommets. This new and unique banner finishing method allows sign shops to make strong, yet inexpensive banner blanks instantly in their own shop. 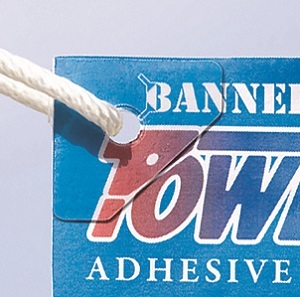 Banner Ups PowerTabs® adhesive grommet tabs are less conspicuous than grommets and blend into the banner substrate for a more pleasing visual effect. They are available in regular size for outdoor banners, mini size for indoor or light duty outdoor use, in white, and now in crystal clear for full-color digital banners.